We use fresh ,seasonal, and local ingredients. Matsuba Crab is the king of the delicacy in winter. Hamasaka fish port is proud of the largist catch of Matsuba crab in Japan. Enjoy great tasting Matuba crab flesh, sweetness and juiciness. You can savor the authentic and fine taste of locally grown ingredient ,sea products used by Charcoal Grill around Irori(fireplace). These delight to your eyes as well as tongue.Sit down around Irori and eat slowly. 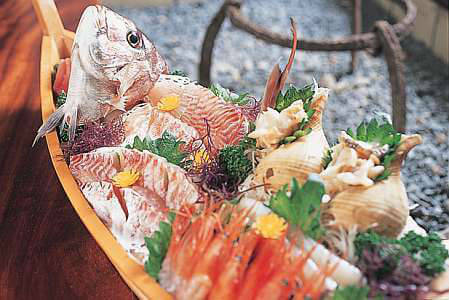 In summer, We offer Kaizoku-Yaki,sea foods freshly caught from the sea of japan.by Charcoal Grill around Irori(fireplace). Tajima beef is famous for the breeding cow of Kobe beef and Matsuzaka beef. The flesh of Tajima beef is resiliet ,yet savory and finely marbled. Experience authentic high-quality beef. Shabushabu Course;par boil the slices of Tajima beef ,pride and joy of Tajima local. You'll be happy as soon as you put it in your mouth. You can't stop eating it! Japanese breakfast.Delicious rice, onsen egg,flesh fish,salad,two~three kobachi(sidedish),miso soup,and coffee.